2 bedroom 2 bathroom duplex on Los Almendros urbanization of Valle del Este Golf Resort with allocated parking, communal pool and excellent golf & country views. 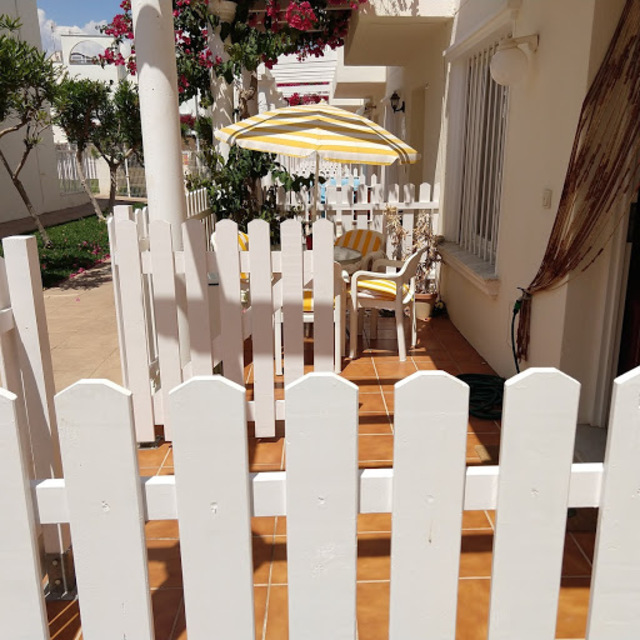 This is very generously proportioned home is located on the award winning Valle del Este Golf Resort which is situated just 10 minutes from the beaches of Vera Playa with great sea views from around the course. Facilites at Valle del Este include a luxury hotel, 18 hole golf course, golf club, pro shop, driving range and practice putting area plus a commercial centre with bars, restaurants and shops. The hotel also offers a fitness club and spa treatment centre. These facilities are all located a short walk from the property. The spacious 2 bedroom first floor duplex is superbly located on the Los Almendros complex, overlooking the 4th fairway, and, with excellent views to the countryside beyond. The front door of the property opens into a hallway with the kitchen to the right, and a door leading to the utility/patio area. On the left of the front door are the stairs leading to the first floorwhilst the living room is straight ahead. The lounge/diner has large patio doors leading out to the ample terrace area. To the immediate left of the kitchen door is the downstairs shower room& W/C. A staircase leads to the first floor landing area, with a large family bathroom, and two double bedrooms, both with fitted wardrobes. The development boasts various communal garden areas and a superb communal pool. At this price, this property is hard to beat as a great holiday or golfing home!